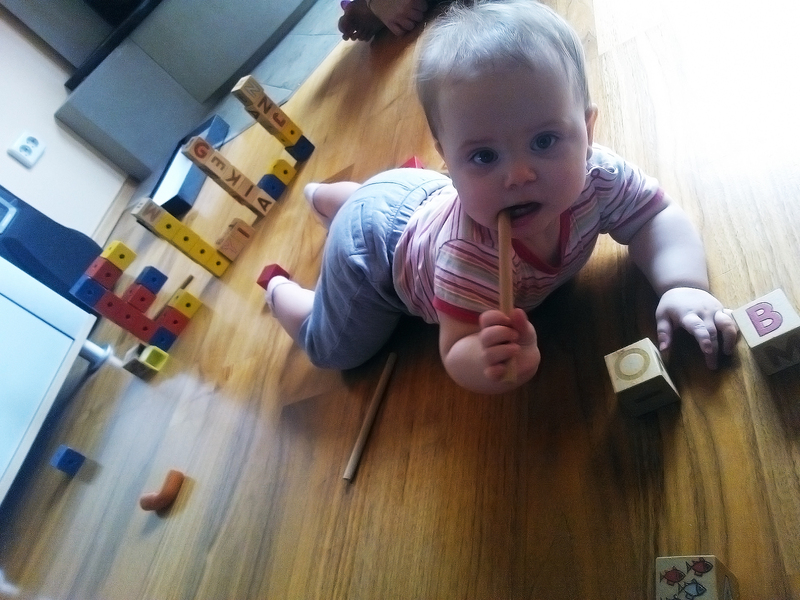 The baby’s idea of playing is pretty basic: if there’s a tower of blocks, someone has to tilt it. If there’s a building material (here: a wooden stick) you’ve never come across before, bring it to your mouth for closer inspection. Dad seemed to be into more complicated constructions like pyramids and such. The little lady ‘helped’ him by kindly removing the top block of the pyramid – I guess she felt it was ‘too much’ and needed a feminine touch. They finished off their hard day’s work of building with some crazy funny dancing. Ladybug has a new dance move: vigorously shaking her head to the rhythm of the music. So that’s what they did. Shook their heads like two maniacs to the sound of the Fisher-Price dog singing.